Sorry guys, did not realize that I had not blogged about my Inmarsat fun and games….. There are a few different ways that aircraft communicate back and forth with the airline. This blog is about satellite. There is a geostationary (not moving, very handy, no tracking needed) satellite named Inmarsat (sorry, forget the exact number, there are a few of them) that carries, among other things, aircraft data. 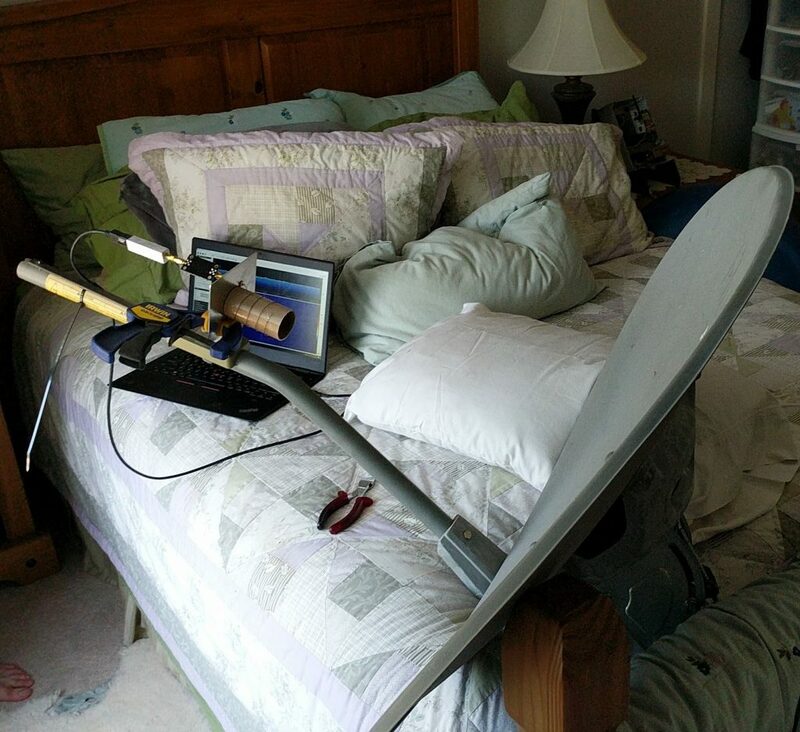 To pick it up you need a small dish, an antenna, SDR (software defined radio) and a computer to run some software. First things first. As it happens, I knew this day was coming so have been collecting satellite dishes behind the shed for a while, turns out I kinda lot track and have about 5 of them back there…. hey, its good to have options. Next, you need an antenna or feed horn. So I did what all good hackers do and wound one around a toilet roll. 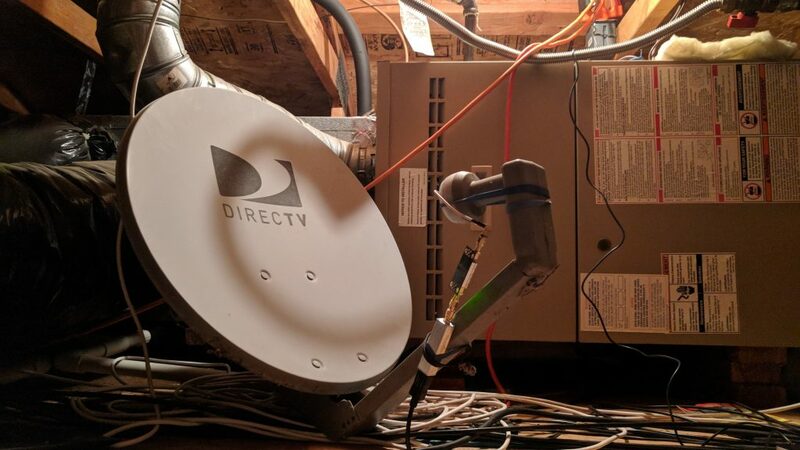 Next up, attache it to the dish and see if you can get some signal. And we did, but the mounting was a bit unsustainable and looking out the window was also not the best, but here is how it looked for the test. Next thing to try was jamming it in attic. Let me tell you about the nice words that were expressed in getting the dish through the manhole and aligned to look at the satellite. There is alfoil over the roof and it really killed the signal…..
Freddy came up with the idea of putting a pole on the side fence and hiding it behind some bushes out there, so thats what did. Finally we had a good strong signal and a nice solid mount. The eagle eye among us might notice that the feed horn is not the toilet roll. And your right. 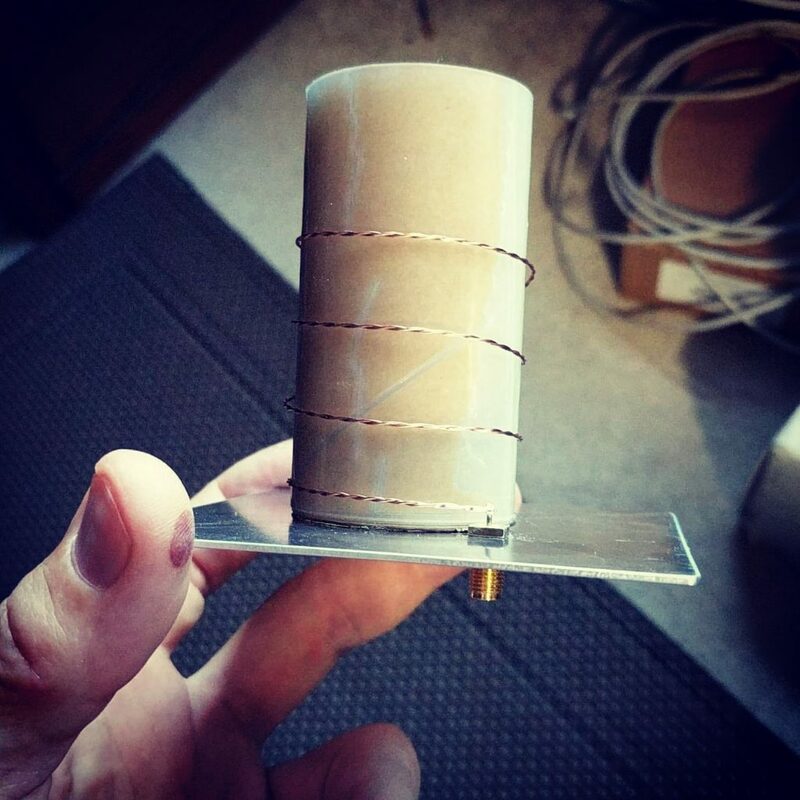 I modified a GPS antenna and its much better as its smaller, flat and has better gain. 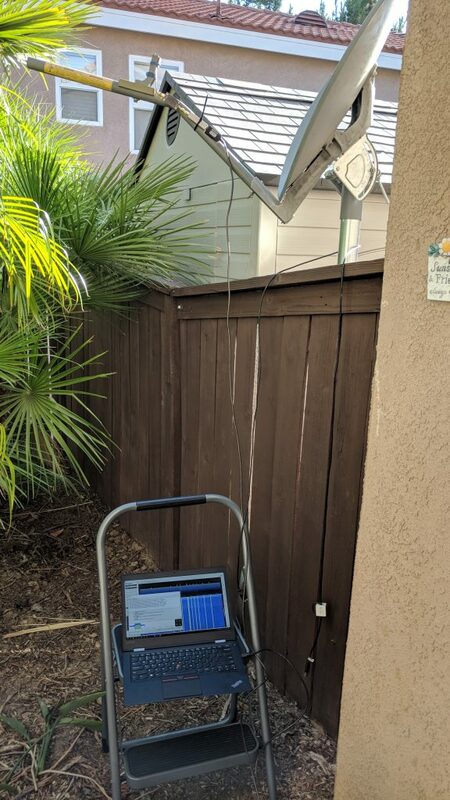 So with a 30 foot long USB lead, we now have a signal in the garage where we can use the software JAERO to decode the signal and stream it to my main dashboard. Long term my plan is to get another GPS antenna and have a second decoder running to double my data rate. So yeah, that’s how I pick up aircraft text messages from space. We have been interested in building a one stop shop website for all things aircraft tracking and decoding for some time. To this end we have put up a satellite dish to get Inmarsat messages, 136mHz antennas for ACARS and VDL data and for HF we have been running an Alinco receiver. Everything has been working great, but I have always struggled with a really high HF noise (static) floor. It massively impacts my ability to pickup and thus decode the weak signals coming from the aircraft all around the world (the radio at this frequency – 6mHz – can hear aircraft from pretty much around the globe). I have been tinkering with the antenna and noise suppressors and all sorts of things, but it has always not been great. 1% of the traffic. Ouch. But he was right, I had a feeling I was not doing great. Getting around 70 messages a day from aircraft. I honestly suspect any one or all of the 90 or so computer devices that are running 24×7 at the house. Anyway, buddies to the rescue. I have been chatting with two guys from Phoenix a fair bit and one of them is big into both aircraft and HF and he also noticed that he was getting more traffic than I was, but he lacked the computer skills and gear to decode them. So yeah, we made a deal. If he picked up the signals, I would decode them. Thus he has dedicated one of his radios to aircraft and I wrote some code to transfer the raw data from his place to mine where I do further decoding and display it on my website. BOOM! I cant believe it but we went from 70 a day to 3000+ a day. We are now almost drowning in lovely lovely aircraft data from around the world. Both he and I are thrilled. Its been running great for the week or so and neither of us see why that won’t be the case for a good while longer. Turns out that aircraft blat out more than just their positions. They also send a lot of short messages that anyone can receive and to some extent decode and make some sense of. This has been keeping me busy for the past month or so. Been really enjoying being distracted from other things, and my love of all things aircraft gets a good dose of love. 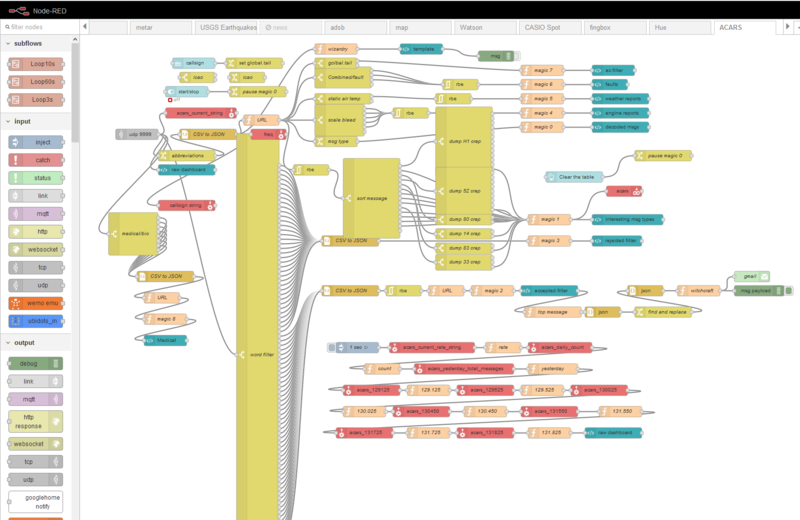 The fact that I also use Node-RED to decode the messages is also very helpful as I needed a project to dive deeper into it. I started off with the freely available acrsdeco2 program and the real power of this program is that you can run remote instances of it and have it feed into a central server. I sent a Raspberry Pi and two receivers to my mate in Phoenix and have his data added to what I can pick up. The net results is that we have pretty much the whole area now covered with just the two receivers. More would be good and we will look at adding a few more in due course, but for now, the two systems working as one does the job. From there I added Node-RED. Doing a ton of reading got a lot of the abbreviations entered into the system and then I started filtering out the boring positions reports. I split off the airborne weather reports and engine reports. I then added several displays that showed this filtered and partly decoded information. The flow is by far and away the most complex I have done. The top line is just helpful data for me to see how much data we are handling. Some quick links to other parts of the system and weather stations at each location are included. Next is heavily filtered messages. At times I can see more than 1 message a second and they scroll past too fast to read, so I do some heavy filtering to slow the interesting stuff down. Next is an aircraft call sign filter. If you want to follow a specific aircraft, this is the tool to use. Next is the raw message. This way you can just what we are working with. Below that is a way to stop/ start the raw lightly decoded messages. Then you have the real interesting stuff. It is the result of the filter and should be interesting enough that we email it to a few of the guys and myself. Below that, the reports and a table of last seen (heard) aircraft. All in all, fascinating stuff.